This project really began over a year ago, when I cast on for the original Prentice. I had just gotten back from a research conference and wanted to make a poster tube carrier to make transporting my research posters easier and make it less likely that airport security will accuse me of trying to carry on a pool cue or a battering ram. I have carried the original Prentice to a couple conferences since, and it’s held up pretty well. People always make nice comments on it too. Then I had the brilliant idea that I would also make a yoga mat bag version—I needed another bag anyways—and write up the pattern for both versions. Shown here is the graph of my enthusiasm about the project vs. time since cast-on. Key points are annotated. 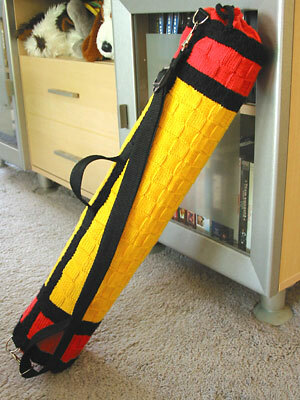 Now that it’s done, I really like the finished yoga mat bag. It’s just big enough for a standard-size yoga mat and yoga strap. Like the original Prentice, this one has handles made of nylon strapping attached with metal hardware. The length of the main strap is adjustable. I love the bright colors and sheen of the Tahki Cotton Classic. I’m sure I’ll use and love the bag for years, but I’m glad to have this one off my project list. CogKnition posted this on September 5th, 2007 @ 7:57pm in Bags, Finished Objects | Permalink to "Prentice Yoga Mat Bag"
It may have been a pain to knit, but the finished project is beautiful! Great job! It’s so pretty! I love the bright colors, and how it looks so cushy. Congratulations!